The barrel fit on Chen Custom 1911s is centered on blueprinted timing to ensure the very best in reliability, accuracy, smooth function and durability. 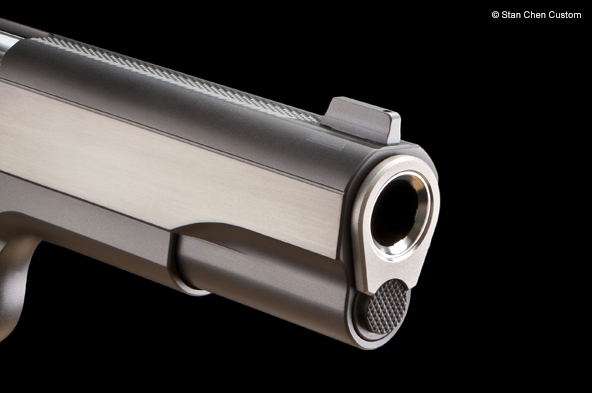 The barrel, frame and slide are precisely laid out and machined to optimal specs so that at every moment of the firing cycle, the barrel is positioned exactly where it was intended to be for flawless function. How the barrel’s lower lugs are cut, and the arc of movement determined by the length of the link (all in relation to the other dimensions of the pistol) is critical to the timing of the pistol. Traditional methods leave this timing to chance, almost as an afterthought. Stan starts with barrel timing as the core, ensuring that at every moment in the firing cycle, the barrel is perfectly positioned. This affects many aspects of the pistol’s function, including feeding, extraction and ejection. All lockup areas are precisely mated together, resulting in match accuracy, repeatability and buttery smooth function from the get go. Poorly timed barrel fits can lead to unreliable, erratic function, poor accuracy, increased wear on locking surfaces, and stress on parts leading to failure (including peened lugs, cracked lower lugs, broken slide stops). The lockup of the barrel, frame, slide and slide stop is 100% solid, yet smooth to ensure the utmost in mechanical repeatability. There are three potential bearing surfaces in the barrel’s upper radial locking lugs. Most stock or even custom 1911’s only bear on one of these surfaces. As the pistol shoots in, this single contact begins to wear, and the gap between the barrel hood and the breechface opens up. As part of the Blueprint Fit, I carefully machine the upper radial lugs to match the recesses in the slide, and bear on all 3 potential contact points. This gives greater stability to the barrel as ignition occurs. It is a more durable fit, and with triple locking lug engagement, the fit of the barrel hood does not loosen up over time. All three upper lug interfaces between barrel and slide are fit to make hard contact during unlocking, ensuring maximum strength and longevity of barrel fit. Unlocking forces spread are among 3 bearing surfaces rather than just one. This is a level of fit and precision relatively unheard of in the custom 1911 industry. The chamber is precision reamed with a carbide reamer custom ground to my exact custom dimensions. My unique chamber dimensions enhance reliability while giving up nothing in accuracy. A series of removable pilots in .0001” increments, along with extremely precise set up, ensures concentricity of the chamber to the bore. The barrel bushing is precision lathe turned. Using a custom built fixture, both the OD and ID are machined in one setup, ensuring perfect concentricity between barrel and slide.